If you have an SUV, you may need more than a standard floor jack to raise your vehicle. Below we outline what to look for in a quality floor jack, and which ones we believe to be the best. Lifting an SUV, or similar vehicle, brings a few challenges. First, they are typically heavier than your average car. This means that you have to search for a jack that can handle that weight, and be able to do that safely. The last thing you want is the jack failing, which could cause damage to your car, or worse, you. Of course a car lift would be ideal for lifting your SUV, but since most people can’t afford one a good floor jack is an inexpensive alternative. A floor jack with a maximum lifting capacity of 3 tons is more than capable of handling most SUVs safely. The second challenge that is presented when lifting SUVs, is the height of the vehicle off of the ground. In general, SUVs are taller than compact or economy cars. This means that some jacks may not be able to completely lift the vehicle off of the ground, resulting in a useless tool. A maximum lift height of around 16 inches is usually high enough to get most cars up in the air, but make sure to check that the jack height will work with your car. The floor jacks we mention in this list meet all of those criteria. They are safe units, with a high weight capacity and maximum lifting height. Click the buttons above for detailed information about each unit, or read on for our review of each of the top 3 floor jacks. Our top choice for the best product in this review is the Powerzone 380044 . This floor jack can more than take care of your lifting needs with an ample 3 ton lifting capacity. As well, this model sports a light-weight aluminum construction, with a steel lift arm that provides strength where it is needed the most. The range on this model is exceptional with an 18-1/4 inch max height, perfect for lifting SUVs. 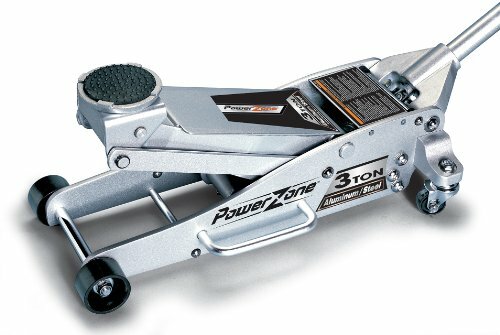 The Powerzone jack is loaded with features including a time-saving fast raising hydraulic system, rubber encased saddle, and swiveling rear wheels. This floor jack is the best rated model on the market, receiving over 800 four and five star reviews. Product testers have said great things about the Powerzone, such as “this jack is a beast”, and “It’s truly versatile, looks great, and is built for a pro.” Not only is the Powerzone the best floor jack on the market, it can also be had at a great price. 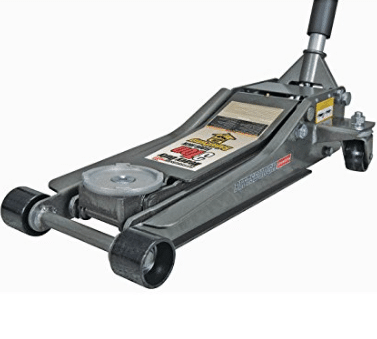 The 2nd best option in our roundup of floor jacks is the Pittsburgh Automotive Floor Jack. This low profile jack is made of steel construction, making it very durable. The automotive jack by Pittsburgh is the perfect combination of quality and affordability. The Pittsburgh automotive jack comes equipped with everything you would expect on a high quality floor jack, such as solid construction, a low profile, rotating rear castors for maneuverability, and a quick raising and lowering speed. The low profile build of this product allows it to be lowered to 2-7/8 inches, but that does not hinder the jack from raising up tall vehicles, as the maximum lifting height is 19-3/4 inches. The maximum lifting capacity of this jack is 3 tons, which should allow you to lift up pretty much any car that you want. The automotive floor jack by Pittsburgh is another highly rated unit, garnering over 124 ratings with over 90% of them 4 or 5 star. Buyers of this jack have even mentioned that they have an SUV and this unit works great with it. 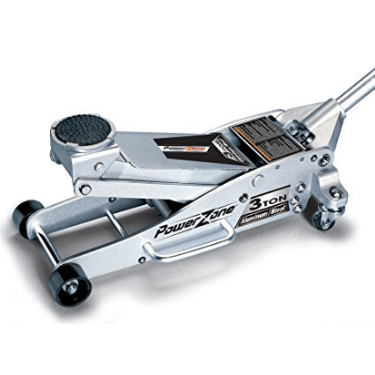 Overall, the Pittsburgh floor jack is an excellent jack at a very reasonable price. 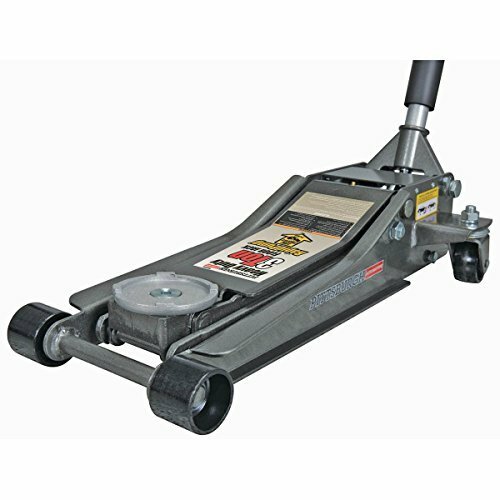 The final item in our review of floor jacks compatible with SUVs is the Torin Big Red T83006. This jack is the most affordable product on our list, and even though the quality is not as great as the other models mentioned, it still shares most of the features that they do. If you are on a budget but are still looking for a quality jack, this is the right choice for you. Just like the other two, the Torin is highly capable of lifting heavy cars, as it has a maximum lifting capacity of up to 3 tons. It comes equipped with an extra long neck, which gives it a great maximum height. Unfortunately, this also gives it a higher minimum height, so it may be harder to fit under low profile vehicles. The lifting range is 6 inches at the bottom to 21 inches at the top. Another nice feature included with this model is the swiveling rear wheels, which really help position the jack under the car in the right spot. The general opinion of people who used the Torin T83006 jack is that it works well, and is capable of lifting tall and heavy vehicles with ease. Like we stated earlier, this floor jack is not quite as good as the other two models, but the insanely low price makes up for the lower quality. A floor jack is the most commonly used type of automobile jack. Also known as a “car” or “garage” jack, this type of jack can be found in almost any garage, and it is used for tasks as common as changing or fixing a flat tire. But that isn’t all that a floor jack is used for. As one of the simplest and universally used jacks, the floor jack is versatile and helpful in most automobile repair situations. The floor jack fits inside of a special groove built into cars in order to properly facilitate the safe lifting of automobiles and other vehicles designed to be used in conjunction with a common floor jack. As stated before, the floor jack is the most commonly used type of automobile jack. It is found in most garages to facilitate many types of automobile repairs, as well as in a smaller version inside most cars in order to help change or fix flat tires while on the road. 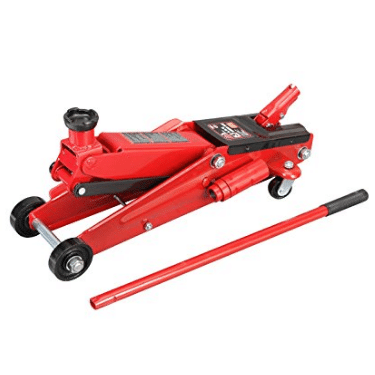 Using a floor jack is fairly simple, but also requires a certain level of precaution, which comes with the usage of any type of jack for lifting a heavy automobile. 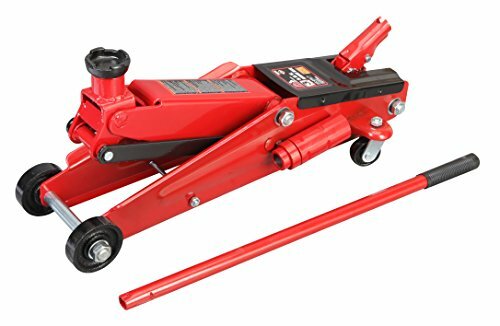 Typically hydraulic, the floor jack is used to lift up cars, trucks, and other types of heavy machinery in order to repair them. They are useful for any type of work that requires safe access to the underside of a vehicle, as they are both safe and reliable when utilized correctly. Most commonly, floor jacks are used for car tire maintenance. They are the safest and most reliable way to lift a car in order to change out the tires. However, they are also utilized when the car requires body work that has to be done on the underside of the vehicle. There are different sizes of floor jacks that are meant to lift bigger vehicles, such as farm machinery and large trucks. Floor jacks are very commonplace and generally simple to use. To use a floor jack, first ensure that the vehicle is placed in park and that the emergency brake is on before lifting the car. Most vehicles come equipped with a groove in which to place the floor jack. This is to prevent both damage to the body of the vehicle, and the vehicle rolling off the jack while it is lifted. Floor jacks lift in an arc, so as to compensate for the arc of the car while it is being lifted, and to keep the weight distributed to the other wheels of the car as best as possible. 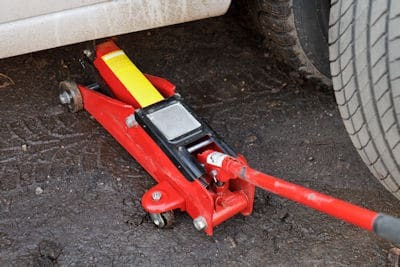 Floor jacks are also often used with jack stands, to help distribute the weight of the vehicle and make it possible for the jack to lift it without damage. Once the jack stands are in place and the jack placed into the groove, it can be pumped to lift the vehicle to its desired height. The vehicle should not be occupied on while on the jack, but instead allowed to rest on the jack stands to prevent death or injury from the vehicle rolling off the jack. In finishing up this article, we wanted to make sure to mention that you should always have safety in mind when lifting up a vehicle. If not done correctly, serious injury can occur. Always practice caution, and be smart about how you lift the car. If you need to lift up a low profile vehicle, be sure to check out our review of bottle jacks.